If you have the time for just one walk on Mont Granier, you are recommended to make your ascent by this route, and your descent down the Pas des Barres (map) for a walk you will never forget. The walk starts from la Plagne, and you should leave your car at the parking area on the right just before the village (1080 m, grid ref. UTM 31T 72716 50364). 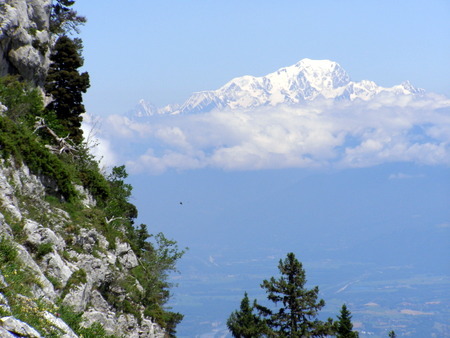 The first target of the route is the Grotte de la Balme à Collomb. This is difficult to pick out from la Plagne, but it is located at the base of the cliff above the wooded ridge on the skyline to the north of the village. Note that the cave is incorrectly labelled Grotte Balme à Colon on the IGN map. Find your way into the centre of the hamlet, either by following the road, or by following the footpath that cuts out the bend in the road. A sign post indicates the route to Col l'Alpette to the east, but we follow the path to the north. This follows a stony track between pastures, which swings right at Les Granges du Priz (a collection of barns), and left again round the top of the pastures. The path then ascends steeply through pleasant beech forest, until it levels out after 45 minutes when it reaches the crest of a ridge. The IGN map marks the path as continuing on into a gully and working its way back onto the ridge, and this is how it was until a few years ago. Now, however, a good path makes its way straight up the ridge. Once above the trees, the entrance of the cave can be seen ahead, and it is reached (1720 m) after about an hour and a quarter. The way on is to enter the cave. Although the entrance is not large, it rapidly opens out into a most impressive entrance chamber, 10 metres wide by 4 metres high, with an exit off to the right. Our way on is through that exit, but it is well worth while first exploring the cave a little further. With adequate lighting, it is safe enough to explore the entrance passages. The way descends gently for 100 metres or so (many ice formations at the beginning of the season) through a diminishing size passage, before abruptly terminating in a narrow rift. Through the rift, a very low passage continues with a slight draft emerging. On the return, look under the right wall a couple of metres from the rift. A low phreatic passage may be seen blocked by a locked metal door. New passages were found behind here in 1988 which resulted in the discovery of the bones from over a thousand cave bears dating from a period of 45,000 years ago to 24,000 years ago. Most have been left in situ, but some are exhibited in the Musée de l'Ours des Cavernes in Entremont-le-Vieux. Returning to the entrance chamber, you should exit out of the side entrance, and follow the path which crosses above the main entrance. The path then follows a grassy traverse for a few minutes before ascending a gully through the cliffs. Near the top, another traverse follows for a few hundred metres where it arrives on the crest at the col between the South and North summits of Mont Granier, and drops down to the path from Pas de Barres. This path initially skirts the basin below the ridge, but it soon climbs up to meander along the crest. This section is a splendid section with outstanding views in all directions. The uninspiring summit, surmounted by a small cairn, is reached in well under three hours. Although the views are stupendous, it is well worth continuing for a further 300 metres to the Cross of Granier. This is situated dramatically on the edge of a buttress right at the corner of the northern cliffs. Behind, you can see all the way down the Vallée d'Entremont to Chamechaude; ahead may be seen the town of Chambéry spread out, and the Lac du Bourget; and to the east the Alps disappear into the distance. On a clear day, the Mont Blanc range looks close enough to eat. Although you may descend the same way, it is strongly recommended that you return by the col de l'Alpette for a really satisfying walk. This returns initially along the ridge, and then drops onto the eastern side. The path off to the Grotte de la Balme à Colomb goes off to the right after half an hour, but our path swings round a wide basin of forest-covered lapiaz. It eventually leads round a shoulder to a terrace overlooking the Alpette pastures. A steep descent down a chimney is made easier by fixed iron steps and railings (Difficulty 2), and the pastures are reached close to a pair of giant boulders. Turning right leads past a useful source feeding a cattle trough, to the col de l'Alpette. An easy descent then leads back into la Plagne, and the car is reached some 2½ hours or so after leaving the summit.